Mens precision watch. 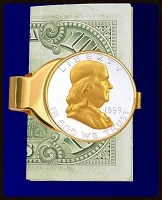 The dial is an AureTone Ben Franklin Half Dollar. Swiss parts movement, stainless steel case and bracelet. Aurista's Saratoga Series timepieces feature Swiss parts movements and the finest quality components, all assembled in America for guaranteed reliable, high precision performance. 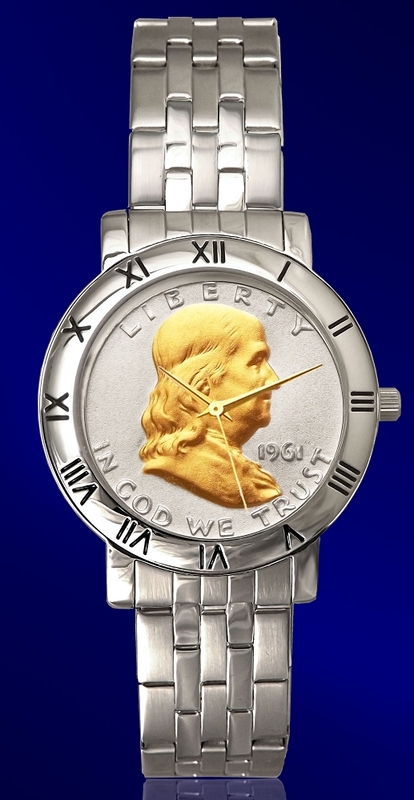 The dial is a Ben Franklin Half Dollar, complete with 24K gold highlights, which is secured within a stylish stainless steel case. Each includes a lifetime warranty against defect and is accompanied by a unique numbered signet and certificate of authenticity.